Chris Eaton, Chris Eaton, a Biography, Book Thug, 2013. CHRIS EATON, A BIOGRAPHY is a novel that arises from the idea that we have all been driven, at some point, to Google ourselves. And if you did, what did you find? That there are people out there who seem to have something in common with you? Dates, places, interests? How coincidental are these connections? And what are the factors that define a human life? We are the sum of our stories: Anecdotal constructs. We remember moments in our pasts the way we remember television episodes. In pieces. And we realize that our own memories are no more valid in the construction of our identities than stories we've heard from others. 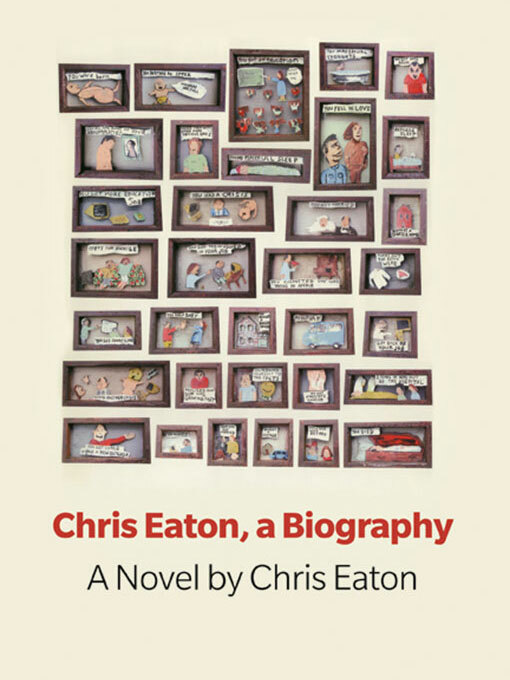 CHRIS EATON, A BIOGRAPHY constructs a life by using, as building blocks, the lives of dozens of other people who share nothing more than a name, identities that blur into each other with the idea that, in the end, we all live the same life, deal with the same hopes and fears, experience the same joys and tragedies. Only the specifics are different. From birth to death and everything in between, the narratives we share bring us closer to a truth about what it means to be alive. To be you. Everyone ego surfs. The act of putting one’s name into a search engine is a measure of self-worth—proof you are important enough to be carved out of the Internet’s chaos by way of a Google algorithm. Blessed with a common name, Chris Eaton (the New Brunswick-born author and musician who does a pretty trippy version of Justin Timberlake’s SexyBack) uses the lives of other very real Chris Eatons as narrative fodder for a novel about his many namesakes. There’s Chris Eaton the politician, the maker of Star Wars figurines, the tortured experimental musician, the Cure-obsessed weird kid, the 18th-century orphan, the wrestler. Chris Eaton is gay, straight, male, female, dead, alive, an enduring success at life, an abject failure. They are tied together only by name and by Chris Eaton’s beautifully overstuffed prose. We’ve all done it — Googled ourselves to find out what the Internet has to offer in our name. If you’re like me, you discover you’re the end of the line, that the only person who shares even your last name is your partner, and your universe ends there. Chris Eaton has a lot more to work with. This pseudo-biographical novel is divided into nine parts, beginning with the roots of the Chris Eatons presented here, and continuing through childhood, adolescence, university years, and so on, right to their various ends. The Chris Eatons (and various anagrammatic permutations) who populate this novel are women, men, straight, gay, and other, and they kaleidoscope through various occupations and creative passions. The narrative is fractured, each story told in brief vignettes, often with long digressions into the minutiae and obsessions that direct the thrust of their lives. Born in New Brunswick, the Chris Eaton who is the author of the present book, is a novelist and musician. He now lives in Toronto, where he plays with the indie rock band Rock Plaza Central. If you Google him, you’ll find Chris Eatons who share similar biographic details; for instance, there’s the Chris Eaton who writes books on missionary work, and the Chris Eaton who plays Christian rock. Since this novel’s author lacks a website of his own to distinguish himself from the other Chris Eatons, it can get very confusing. But then, perhaps that’s the point. These real and fictional Chris Eatons meld all distinctions and a composite Chris Eaton emerges. To underscore this, the novel offers various metaphors on the theme that these stories and people do intersect — in drops of water, in mathematics, in painting. The Internet didn’t invent narcissism, but it has had the effect of amplifying already powerful cultural trends taking us in that direction. Social networking, after all, has nothing social about it, but just provides a way for us to spend more time alone. The Internet is a mirror in which we endlessly examine ourselves, analyzing not just our own identities but the way others see (and evaluate) us. Or, taking the metaphor of the network, the Internet is a web that always has us at the centre. Who, for example, hasn’t Googled him or herself? And when we find all of our name’s secret sharers, haven’t we wondered if there might be some mystical connection between us and that legion of virtual avatars and digital selves peeking out from behind the Cloud? Such a sense of connection is the inspiration for Chris Eaton’s Chris Eaton: A Biography. Notably, it is not an autobiography. Chris Eaton has little to do with the Chris Eaton who is a Canadian musician (recording as Rock Plaza Central), and currently one of this country’s best under-the-radar writers. Instead what we have here is a composite portrait of a number of Chris Eatons: men and women, gay and straight, young and old. After a while it becomes hard to tell some of them apart, but that’s the point. The life you’re reading about might be your own. The book’s loosely biographical structure follows Chris Eaton (all of them) from cradle to grave. But Eaton (the author) isn’t interested in telling a story in the traditional way, unless the tradition you’re referring to is that of the experimental “new novel” or magic realism. Within those terms of reference one can recognize a number of familiar elements, as we are constantly being sidetracked into rambling lists, historical background, flashy displays of esoteric research, and complex digressions dealing with obscure (and often imaginary) subcultures and secret societies. It’s information overload, and it poses the question of just how all of this information — and we are all bits of information now — adds up to a life: that is, something coherent and meaningful with a beginning, middle and end. Your Facebook and MySpace pages, your LinkedIn profile and Twitter account, your personal homepage and network of friends, your genealogy, cache of Google searches and other digital spoor . . . you can package all of this together into an identity that can be sold to advertisers, but the whole will be less than the sum of the parts, and has little relation to your life as you experience it. That’s perfect, both at capturing in a jumble of discordant analogies how an awkward three-year-old moves, and how those movements feel.